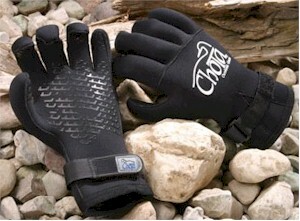 The ultimate glove for Extreme cold water footer. These fleece lined 3mm neoprene gloves feature triple-glued and blind-stitched seams for superior warmth. The pre-curved design and Tacky Grip palm and fingertip pads assures a secure grip, while the Velcro wrist closure keeps the glove snugly in place. Great in water temps freezing to 55.